Art students at the Royal College of Fine Arts learned new methods of using monoprint and explored possibilities for self expression. Young artists at the Reyum Institute of Art and Culture participated in Art in a Box’s master classes and created their own hand printed monoprints. 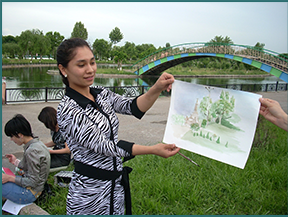 Students at the Kamoliddin Bekzod Institute of Art and Design in Tashkent participated in Art in a Box’s Nature/Culture art class. 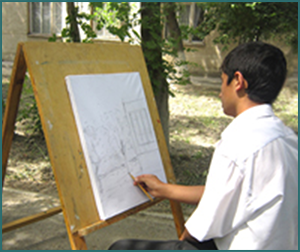 Students at the Art Lyceum in Bukhara participated in Art in a Box’s Nature/Culture art class. They responded to the natural environment and their cultural legacies to create original paintings. 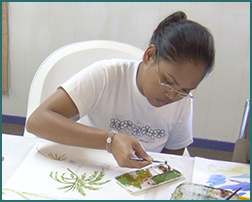 Students at the College of the Marshall Islands in Majuro, the Republic of the Marshall Islands, were introduced to color theory and studio painting classes during Art in a Box’s visit to the Marshall Islands. Art in a Box provided a Young Artist Mentoring Award to recognize a gifted and talented student.